The Siamese fighting fish, or the Betta as he is better known, has got to be one of the most popular aquarium fish of all time. With their brilliant colors and spunky personalities they have fans of all ages. Bettas usually grow to an overall length of about 3 inches, including fins and live approximately 2-4 years in captivity. Bettas originated in the shallow waters of Thailand (formerly called Siam, hence their name), Indonesia, Malaysia, Vietnam, and parts of China. These countries are home to many acres of rice paddies, ponds and slow moving streams to which the Bettas call home. But as demand has grown for these colorful fish, they have been captive-bred across the globe, both commercially and by private individuals. In the wild these fish are a dull green and brown, and the fins of wild specimens are relatively short. Today the fish being spawned are significantly different than their ancestors of original wild caught specimens. 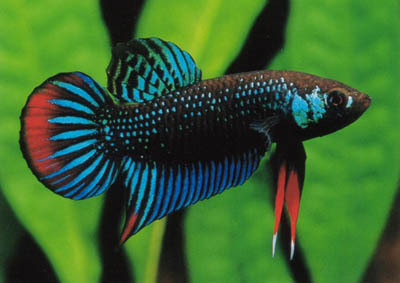 Most of the bettas you see in pet stores today as well as the IBC competitions have been bred for specific features such as new varieties of tail and fin types as well as unique colors.